You play to win. We get it. You don’t want to blindly bet and hope for the best. Sure, technically gambling is exactly that. Yes, there is definitely strategy involved in some games, like Blackjack for example. But for the most part, its all about riding a lucky streak. Because you won, you must bet $5 again. This bet loses, so now you up your bet to $10. This bet also loses, so now you up your bet again to $20. Oh no! Another loss. It’s not looking good, but the Martingale system says to double your bet, so now you’ll bet $40. We’re sorry to tell you but you’ve hit another loss. Now you need to bet $80. Good news! You won the bet. In this example, it seems like you’ve put down a lot of money and hit quite the series of losses. That is true, but in the end, you’re actually ahead $10. It’s true. We’ll show you. On the first bet, you won $5, so you’re ahead $5. At this point, put that initial $5 bet away. You’re now playing with the house’s money. Now you bet $5 and lose. You’re -5. With a $10 loss, you’re -15. With a $20 loss, you’re -35. With a $40 loss, you’re -75. Now that final bet was $80 but it wins. You’re now ahead $5, plus that original $5 that you set aside. Congrats! At the end of the day, doubling your bet all the time will most likely leave you being even or with a win, because eventually that win will come. You need a big bankroll to accommodate for losing streaks, though. Unfortunately, streaks could happen in swings. That means your losing stream might not be 5 or 6 bets. 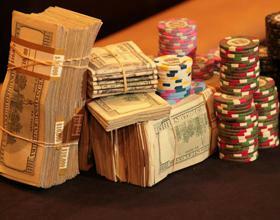 It could be 15 bets long and you might not have a big enough bankroll to keep doubling your bet. What’s more, you could very well hit the table maximum without being able to double your bet. The table maximum varies from casino to casino. If you’re placing a $5 bet to begin with and you hit a string of losses, you’ll actually only be able to go 7 bets before hitting the table max, assuming the max is $500 per bet. The Martingale betting system works best for short stints at the tables. 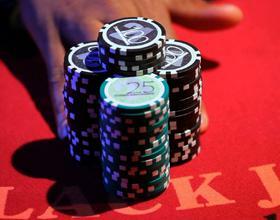 If you’re planning to sit down for hours on end, Martingale might not work to your advantage. But if you want to get in and get out, and make some money, give it a try.